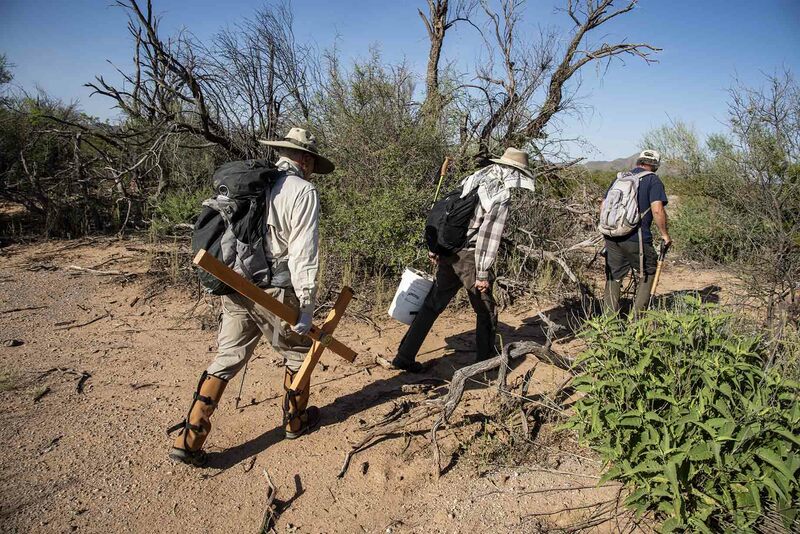 Members of the Tucson Samaritans, here philosopher Allen Buchanan (left, holding cross) and artist Ron Kovatch (center), left their car and walked with Alvaro Enciso (right) to find the location where the remains of a migrant were found and where Alvaro will place one of his crosses. They carry tools and a bucket of cement to fix the cross and a few gallons of water to be left behind near where the cross is placed in order to possibly save another person from death by dehydration, one of the main reasons migrants don't survive the sometimes 5-6 day walk from the border to the nearest town or city. Location: Sonoran Desert, near Tucson, Arizona, USA. Date: September 17, 2018 Caption: For over 5 years now, once every week, Columbian born and Tucson based artist Alvaro Enciso has quietly gone out into the Sonoran Desert, placing a cross in each place where the remains of migrants who died in the desert after illegally crossing the US-Mexico border into Arizona were found by the border patrol. The Countyâs Medical Examiner provides him and his volunteers (usually members of the Tucson Samaritans) with updated maps that lists the exact location of nearly 3,000 human remains, found in the Arizona desert since 2001. The number is continuously growing; Alvaro has made and placed over 800 crosses alread, his project, titled Donde Mueren Los Suenos / Where Dreams Die, is ongoing. The crosses he and his team placed during my visit were for two of this years casualties.